The new Ideal Center of Scientology Israel was dedicated in Tel Aviv-Jaffa on August 21, 2012, in ceremonies attended by more than 2,000 Scientologists from Israel and 27 nations across the world. 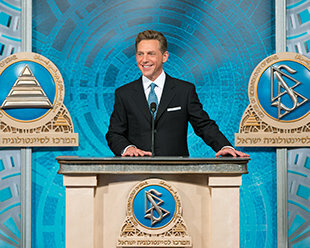 Mr. David Miscavige, Chairman of the Board Religious Technology Center and ecclesiastical leader of the Scientology religion, personally dedicated the Center. Welcoming Scientologists to their new home were city and national dignitaries including Tel Aviv City Council Member Meital Lehavi; Office of the Prime Minister Director for the Bedouin Sector Mohammad Kaabia; Office of The Prime Minister Senior Coordinator on the Status of Minority Women Rania Pharyra; Biblical scholar and author Dr. Rimon Kasher; Jaffa Arab Christian Community Chairman Peter Habash; and historical preservation architect Eyal Ziv. 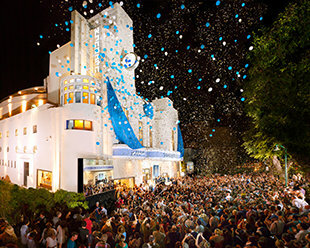 The Center of Scientology of Israel celebrated the grand opening of their new home: the historic Alhambra Theater in the heart of Tel Aviv’s ancient port city of Jaffa. Scientologists from Israel and across the world, as well as national and city leaders, convened for the dedication. On August 21, 2012, more than 2,000 Scientologists, guests and dignitaries celebrated the grand opening of the Center of Scientology Ideal Organization in Tel Aviv-Jaffa. The Center’s landmark home, the Alhambra Theater, was originally constructed in 1937 and now stands fully restored as a center for the entire community. Mr. David Miscavige, Chairman of the Board Religious Technology Center and ecclesiastical leader of the Scientology religion (center) dedicated the Center. Participating in the ceremony were (left to right): Jaffa Arab Christian Community Chairman Peter Habash; historic preservation architect for Jaffa, Eyal Ziv; Office of the Prime Minister Director for the Bedouin Sector Mohammad Kaabia; Tel Aviv City Council Member Meital Lehavi; Office of The Prime Minister Senior Coordinator on the Status of Minority Women Rania Pharyra; and Biblical scholar and author Rimon Kasher. The Center of Scientology’s new home is the historic Alhambra Theater on Jerusalem Boulevard. Originally constructed in 1937, its distinctive Art Deco and International Style influenced many subsequent buildings in the vicinity. The Scientology Center fully restored the 60,000-square-foot building, which now provides for the delivery of all Scientology services and to extend humanitarian programs across the land. The Center welcomes all visitors wishing to obtain an introduction to Dianetics and Scientology. The Public Information Center provides a complete introduction to every aspect of Dianetics and Scientology—including the beliefs and practices of the religion as well as a biographical presentation on the life and legacy of Founder L. Ron Hubbard. The Information Center further presents exhibits on the many humanitarian initiatives and social betterment programs sponsored by Scientology Organizations and members worldwide. Visitors are welcome to take a self-guided tour of the Center’s displays at their leisure and to return as often as they like. The Scientology Center features a permanent exhibit dedicated to the history of the landmark Alhambra Theater, including an extensive photographic display and a scale model of the original building. The scale model of the original Alhambra Theater depicts the building as it stood during the 1930s as a center of culture in Jaffa. The historic Alhambra Auditorium accommodates all congregational ceremonies and services, including weekly Scientology Services open to members of every faith. The Auditorium can also be configured to host seminars, workshops and a wide variety of community events. In that respect, it is dedicated to Scientology Founder L. Ron Hubbard’s vision of all denominations working together to achieve the common dream of all religions. Beneath the skylit stairway to the rooftop stands the Alhambra’s restored glass-faced clock overlooking Jerusalem Boulevard. The rooftop terrace and café, with expansive views of neighboring Old Jaffa, welcomes those visiting the Center or attending its many scheduled events. It is further provided for Scientologists during breaks in their services. The Center provides for the delivery of all Dianetics and Scientology Introductory Services. These include testing, offered as a community service to assist individuals in gaining an understanding of their personal capabilities. The bookstore makes available Founder L. Ron Hubbard’s scripture on Dianetics and Scientology. In all, Mr. Hubbard’s legacy comprises tens of millions of published words in dozens of books and thousands of recorded lectures. Materials are available in 50 languages. The Center houses multiple classrooms for introductory courses on Dianetics and Scientology principles and their application in life—including Success through Communication, which teaches the underlying skill to succeed in both professional and personal relationships. Scientologists participate in auditing (spiritual counseling) in the Hubbard Guidance Center, which has dozens of auditing rooms, each providing a calm, distraction-free environment necessary to achieve spiritual enlightenment. The Academy is where Scientologists train to become auditors (spiritual counselors), capable of applying the technology of auditing to help others attain spiritual freedom. The Tel Aviv Academy comprises multiple course rooms, each devoted to a different aspect of training. Traditional in all Scientology Organizations is the Office of L. Ron Hubbard, honoring the religion’s Founder and symbolizing that this Center is true to his writings and ideals. On August 21, national and city dignitaries as well as religious leaders joined Scientologists from Israel and 27 nations to celebrate the opening of the new Center of Scientology in Tel Aviv. The Center is the first Ideal Scientology Organization (Ideal Org) in the Middle East and designed to both serve the growing membership and provide Scientology-sponsored humanitarian programs throughout the region. The new Ideal Center of Scientology Israel was dedicated in Tel Aviv-Jaffa on August 21, 2012, in ceremonies attended by more than 2,000 Scientologists from Israel and 27 nations across the world. Mr. David Miscavige, Chairman of the Board Religious Technology Center and ecclesiastical leader of the Scientology religion, personally dedicated the Center. Located on Jerusalem Boulevard in Tel Aviv’s ancient port city of Jaffa, the Center’s new home is the historic Alhambra Theater. Originally constructed in 1937, the landmark is remembered by generations as the premier venue for the greatest names in Arab and Israeli music and theater. In the 1980s, the building was converted into a commercial center and by the first decade of the 21st century, its glory had faded. The Center of Scientology acquired the Alhambra and meticulously restored the landmark, to both preserve a site of cultural significance for Israel and provide a center for the entire community. In addition to presenting all Scientology services, it serves as a meeting place for members of all faiths to unite on humanitarian initiatives. To that end, the famed Alhambra auditorium once again stands as a centerpiece for this city. Welcoming Scientologists to their new home were civic and religious leaders from across Tel Aviv-Jaffa, including Tel Aviv City Council Member Meital Lehavi; Office of the Prime Minister Director for the Bedouin Sector Mohammad Kaabia; Office of The Prime Minister Senior Coordinator on the Status of Minority Women Rania Pharyra; Biblical scholar and author Dr. Rimon Kasher; Jaffa Arab Christian Community Chairman Peter Habash; and historical preservation architect Eyal Ziv. The 60,000-square-foot Center of Scientology Tel Aviv is open to all wishing an introduction to Dianetics and Scientology. Visitors are invited to take a self-guided tour of the expansive Public Information Center, presenting informational and documentary films on the beliefs and practices of Dianetics and Scientology, as well as the life and legacy of Founder L. Ron Hubbard. The Information Center also provides an overview of the many Scientology-sponsored humanitarian programs, including a worldwide human rights initiative; an equally far-ranging drug education, prevention and rehabilitation program; a global network of literacy and learning centers; and the Scientology Volunteer Minister program now comprising the world’s largest independent relief force. In full, the Center’s multimedia displays present more than 500 films, available at the touch of a button. The Center is open morning to night and visitors are welcome to return as often as they wish. In addition to services conducted in the restored Alhambra auditorium, the new Center of Scientology further includes seminar rooms and classrooms for study, along with dozens of rooms for Scientology auditing (spiritual counseling). To commemorate the Alhambra’s rich heritage, the second floor mezzanine houses a permanent exhibition open to the public, so the building’s history may be treasured for generations to come. Among the many distinctive features magnificently restored throughout the landmark are the mezzanine’s glass-faced clock overlooking Jerusalem Boulevard and the Auditorium’s intricately molded oval ceiling. The International Style and Art Deco façade has also been returned to its original splendor, from the color block windows and ornamental grilles to the prominent “Alhambra” sign that graces the iconic tower. The Center further includes a rooftop terrace and café. Framed by an oval colonnade, it provides expansive views of the historic hub of Jaffa. The opening of the Center of Scientology Tel Aviv follows a series of new Scientology Ideal Organizations opened so far in 2012, including Los Gatos, California on July 28; Buffalo, New York, on June 30; Phoenix, Arizona, on June 23; Denver, Colorado, on June 16; Stevens Creek of San Jose, California, on June 9; and Orange County, California, on June 2. Further opened this year are Greater Cincinnati, Ohio, on February 25; Sacramento, California, on January 28; and Hamburg, Germany, on January 21. Other new Ideal Orgs opened in recent years include London, Moscow, Brussels, Berlin, Madrid and Rome in Europe; Melbourne, Australia; Johannesburg, South Africa; New York, New York; Washington, D.C.; Los Angeles, Inglewood, Pasadena and San Francisco, California; Tampa, Florida; Nashville, Tennessee; Seattle, Washington; Dallas, Texas; Quebec City, Canada; and Mexico City, Mexico. Five more Ideal Orgs are further scheduled to open in 2012. The Scientology religion was founded by author and philosopher L. Ron Hubbard. The first Scientology organization was formed in the United States in 1952 and the religion has expanded to more than 10,000 Organizations, Missions and affiliated groups, with millions of members in 167 countries.